Photographer: Bonnie Hansen. Model(s): Hannah Elyse. Source: Black Magazine. Stylist: Ella Murphy. Makeup: Chloe Langford. 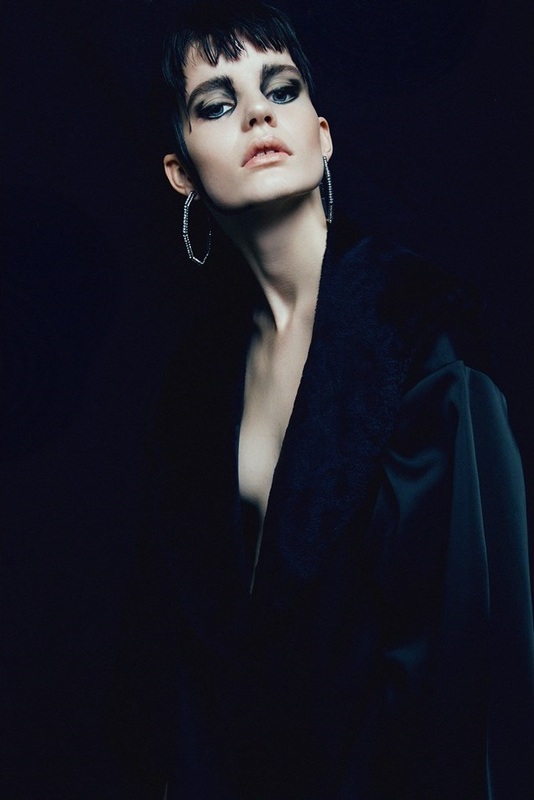 Hannah Elyse lets the artistry of noir sooth her soul in ‘Stark‘ by Bonnie Hansen for Black Magazine. Black-on-black breaks free as each image puts on a show. 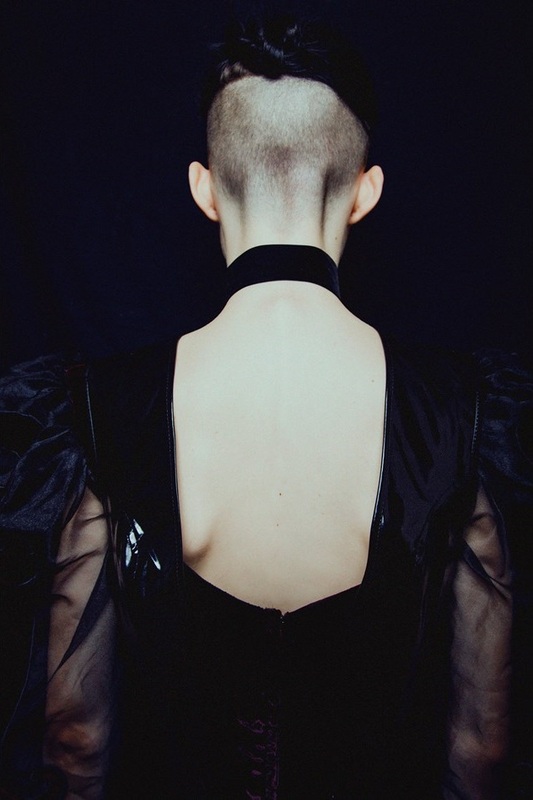 Stylist, Ella Murphy, features the ferocity of ebony fashion with dark designs that bring the heat. Images ache with agony as pictures pull back on innocence. 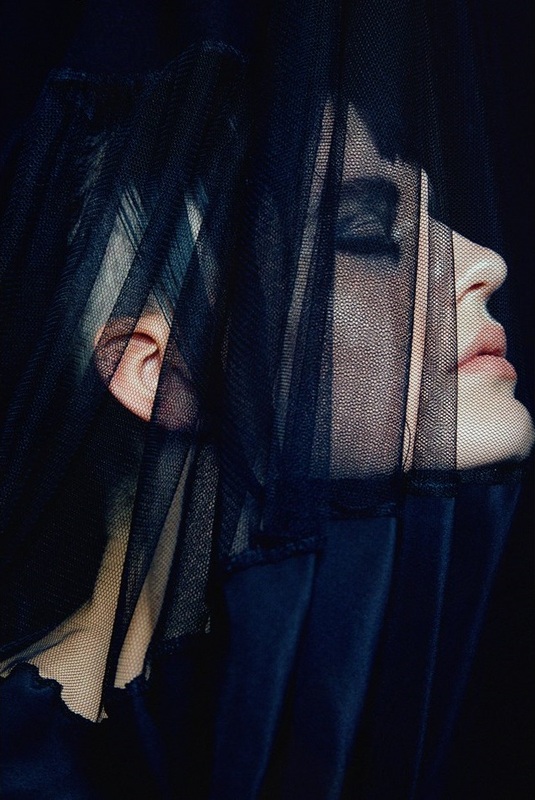 The lure of the skin lets us in as sullen poetry peaks our interest. 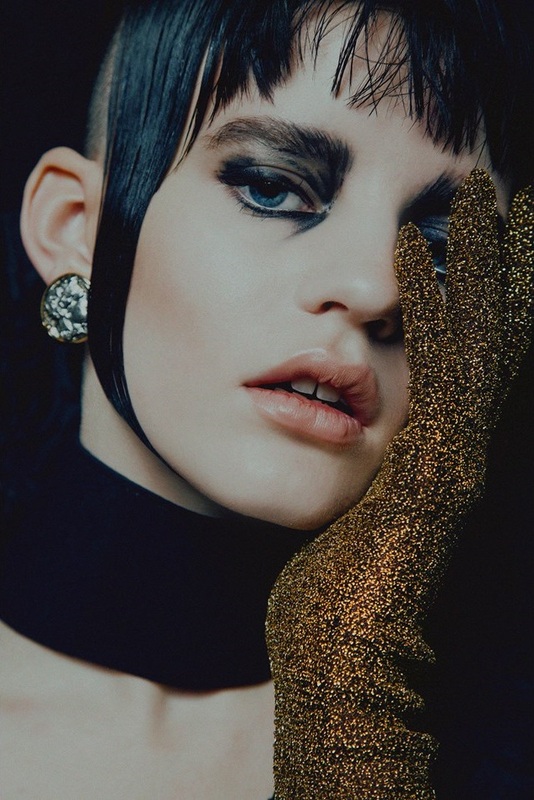 Theatrical beauty builds as (Makeup Artist) Chloe Langford invites us to explore the facial fantasy of avant-garde excess. From one angle the orbs look like creatures of flight, from another they take on a darker view. Onyx bleeds over the lids as blackened shadow careens into the brows. The purity of youth is captured in the peachy pallor of the skin. Cheeks speak up with soft tones that succumb to a flavor of fleshness. Lips hold the power of untapped passion as subtle shades of silence speak. Raven’s wings fly on high with jet black hair that falls in the front and is shaved in the back. 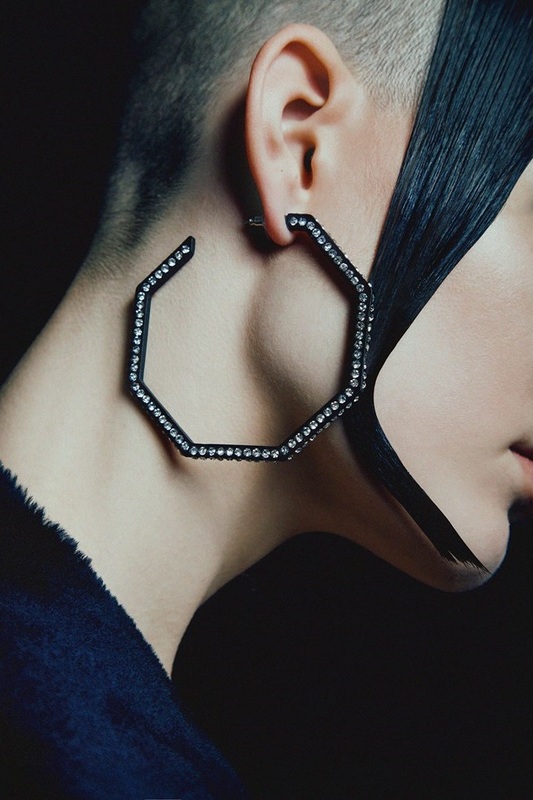 Adorned in ornaments, from octagonal earrings covered in diamonds to retro rectangles clasped in a row. The strength of necklaces lie in the shape of their drape. 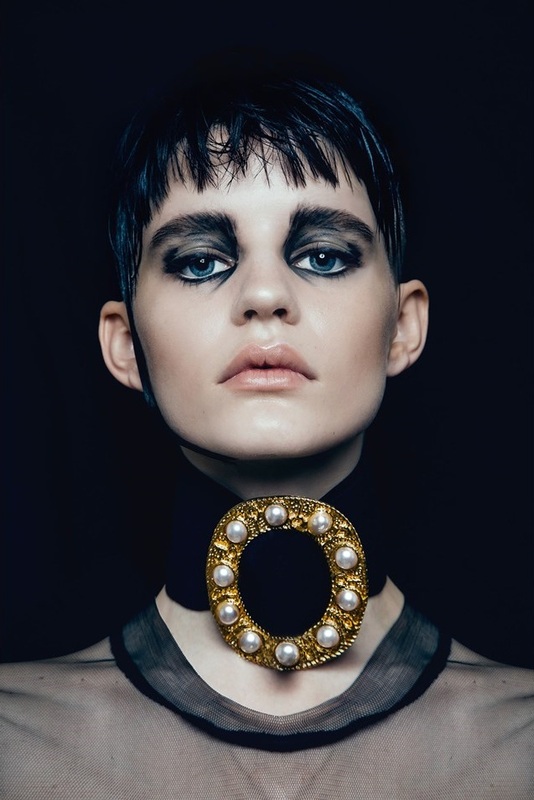 Brushed gold encircles the buckled center with pearls marked evenly around the choker. 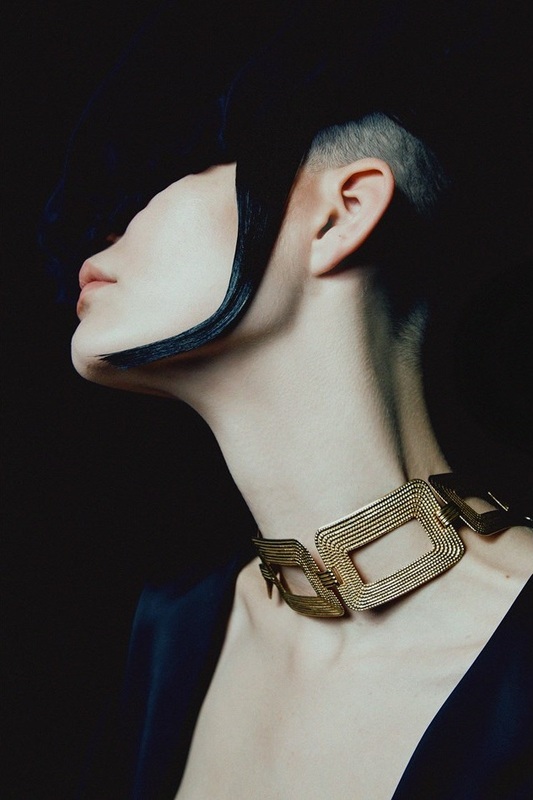 Dynamic accessories deign to be with archival jewelry appearing unearthed from the tombs of Egypt. Resting her head on the golden glove, Elyse takes on an auric glow à la, Michael Jackson. The Artistry of Noir Feeds Music of Melancholy "The New Black"